Why is the best case approval for NBC showing 12/10 if there is this verified case, for example, which was approved with RD in January? Is the case MSC1990455476 showing as approved and verified in our database above? If yes, then we can check as to why this date is not being reflected. Yes, Anil. I just hit the compare button and it appeared as verified. Ok.. thanks for the confirmation. I will check to see why it is not reflecting in the data then. The best case approval data is updated every 3 hours and the one you see using ‘compare’ button is real time. So, it is possible that you saw it earlier than 3 hour window finished. Hi Anil, I filed I-765 (STEM OPT-3c ) on Feb. 12th. I have a job offer and they gave me 2 more week permit. Do you have any idea when I get my opt? Is there any way to increase this process? You can try filing EAD expedite request. The receipt dates listed above account for the “received date” or the “notice date” on the i-797C? The dates given above show the ‘Receipt date’ printed on i797C notice of receipt. I understand. But my receipt has two dates: “received date” and “notice date”. The 2 dates on the i-797C are 9 days apart. So, my question is: to which one of the two dates listed on the i-797C the receipt dates listed above correspond? For example, my received date is 12/13/2018. So if this date corresponds to the receipt date, I am in range for an approval. However, if the receipt date correspond to the notice date on the i-737C, I am not in range for an approval since the notice date is 12/22/2018. As I answered earlier, it should be ‘Received date’. My I-140 got RFE in recent update but my other 485, 785 and 131 remain with same status ‘Case was Received’ from Nebraska Service Center. My PD is Feb 4, 2019. Does this mean my Ead/Combo card will take longer until the RFE will be resolve? Yes, EAD card cannot be approved if i140 is not approved. My case for EAD combo card has been pending for 5 month at National Benefit center. I just got an job offer and they want me to join them with 3 weeks. Is there anyway I can expedite the case? Someone shared her case was approved within 3 month at the same processing center, may I know why her case got processed first than mime? You can file EAD expedite request with congressman. I cannot comment on why other cases have been approved before your case. Is it possible for family members to travel outside of the US after the EAD/AP have been approved but before receiving the card? I could then send them the card by mail abroad before then fly back to the US. I have covered the risks of travel while i485 is pending here. My suggestion is to wait for the AP card before travelling. 485 filed with National Benefit Center on Oct 24, 2018. My priority date is March 9, 2017. We(I and My Wife) got courtesy letter from USCIS requesting I-693 (Medical form) and they asked me not to send now but either to take that with us for interview or if case doesn’t require interview then they will raise RFE and then we can send the same to them. In your opinion, when do you think we should get invite for interview? Also, I saw case status today (EAD receipt number) and it shows “New card is being produced” for both of us. I do not share individual case estimations now. Sorry. It is too difficult and time consuming to reply to each individual case’s estimated times. Hi Anil, QQ if you can answer/provide thoughts. My/Wife’s I-765(EAD application) shows “New card is being produced” but for Travel application it still shows” Case was received”. Does it mean we will only receive EAD and not AP card? Also, traditionally how long does it take to receive EAD card after this status? USCIS usually issues combination card these days for EAD and AP. You can expect the card to arrive within 4-15 days. Anil, got one question about Medical. I will be going for Medical today (because we got courtesy letter from USCIS to bring the I-693 to interview), though interview is not yet scheduled. I saw somewhere that it should be signed by Civil Surgeon no later than 60 days. I believe I am fine in this scenario as my 485 was filed on Oct 24, 2018. Correct? I see that medical would be valid for 2 years after surgeon signs it. This question is out of scope of this page. I would request you to please ask it on our forum as we want to keep the questions here related to the topic of this page. Thought of sharing..Today we (I and my wife) received EAD-AP combo card finally. I see that its valid for 1 year. Congratulations. Thanks for sharing your case update. Can I call to USCIS and let them know that my husband moved to new employer and can I submit my approved h4 for the pending h4 ead renewal application? Does it cause any mess to my husband h1? You cannot send any documents until USCIS explicitly asks for them. My suggestion is to wait for result or RFE. Anil- my L2 EAD receipt date is 06th March 2019 (California center). I currently came back to India. Will my EAD request have any issue if I travel back to US before approval? I am worried if I there will be any RFE as my I-94 date would have changed. Please suggest if I should stay back in India until my EAD gets approved? I have answered questions about travel while EAD is pending here. I have specifically talked about H4 EAD on the linked article but the rules are same for L2 EAD. 2. You can file new EAD application with new I-94 dates , so you will have two application pending with USCIS. both are independent . If first one gets rfe then second one will get approve in a month( ex : if you apply early May , then it will approve in July). It’s upto you to decide. I will apply above 3 for best case. I am not worrying spending 400$ extra on this instead of wasting time. This is my personal experience and not a profession advise. I have applied H4 EAD on March 8th 2019(Receipt Notice) , Vermont center , as my current H4 VISA Expires on November 2019. I am also planning to travel to India in May 2019 back by June 1st week . I will be going for H4 stamping so My H4 VISA will extend till 2021 December. What are my next steps ? I am bit confused here Please suggest me on this ? 1.When Can i Expect my H4 EAD approval ? 2.Will there any RFE if i return with new I-94 Validity ? 3.When I return with new I-94 Validate if My 1st H4 EAD is application is not approved , then Shall I file new H4 EAD application with new I-94 Validate ? 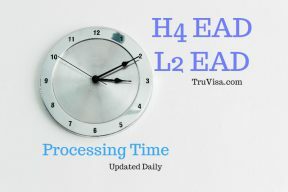 I have answered questions about travel while H4 EAD is pending here. Thanks , I see that . My spouse will be here during my India Visit because of my H4 EAD. Below is the details i may need from you . Please use the processing time estimates given above for your case approval time. AIl your questions have already been answered on the linked article. Please spare few minutes to read it. It will save both your and my time.